Fancy a trip to Europe this summer? Well you might want to check out ULTRA Europe 2018. Back for it’s sixth edition this year in beautiful Split, Croatia, the festival will surely compliment your summer of music with some of the world’s most sensational music headliners. Today the festival announced some of the biggest names in dance music: Afrojack, Alesso, Armin van Buuren, Axwell /\ Ingrosso, David Guetta, DJ Snake, Galantis, Hardwell, and Steve Angello. The Chainsmokers, Eric Prydz and Marshmello will headline the festival for the first time come July. The festival will also see the return of their now world-famous Techno brand, RESISTANCE. Leading the pack will be Carl Cox and Marco Carola. Expect even more announcements from RESISTANCE as the summer quickly approaches. 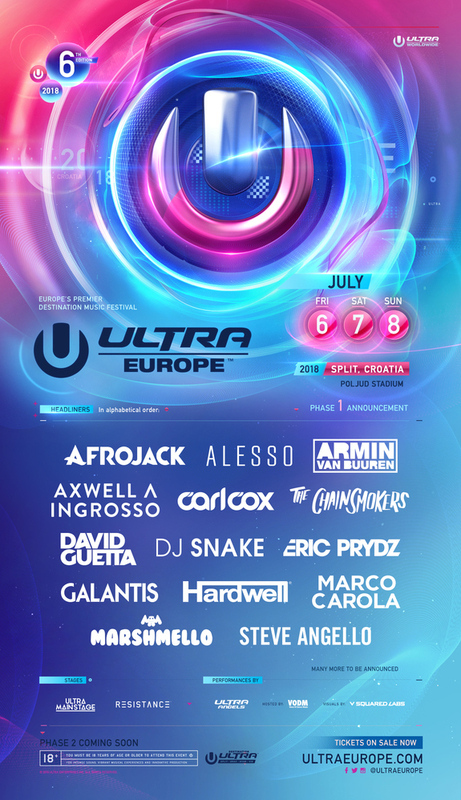 ‘Destination ULTRA’ experience is also back from July 5-11, with huge events spread across seven days. From the stunning Brač Regatta, to ULTRA Beach Hvar, dubbed ‘the greatest pool party on earth’, to the RESISTANCE Vis closing party at the ancient Fort George on the final day, you will not to want to miss this incredible week of music. Tickets for ULTRA Europe 2018 are on sale now, exclusively at https://ultraeurope.com/tickets/2018/.